Aims To evaluate the accuracy, consumable cost and time around testing (TAT) of a next-generation sequencing (NGS) assay, the Ion Torrent AmpliSeq Colon and Lung Cancer Panel, as an alternative to Sanger sequencing to genotype KRAS, NRAS and BRAF in colorectal cancer patients. Methods The Ion Torrent panel was first verified on cell lines and on control samples and then prospectively applied to routine specimens (n=114), with Sanger sequencing as reference. Results The Ion Torrent panel detected mutant alleles at the 5% level on cell lines and correctly classified all control tissues. The Ion Torrent assay was successfully carried out on most (95.6%) routine diagnostic samples. Of these, 12 (11%) harboured mutations in the BRAF gene and 47 (43%) in either of the two RAS genes, in two cases with a low abundance of RAS mutant allele which was missed by Sanger sequencing. The mean TAT, from sample receipt to reporting, was 10.4 (Sanger) and 13.0 (Ion Torrent) working days. The consumable cost for genotyping KRAS, NRAS and BRAF was €196 (Sanger) and €187 (Ion Torrent). 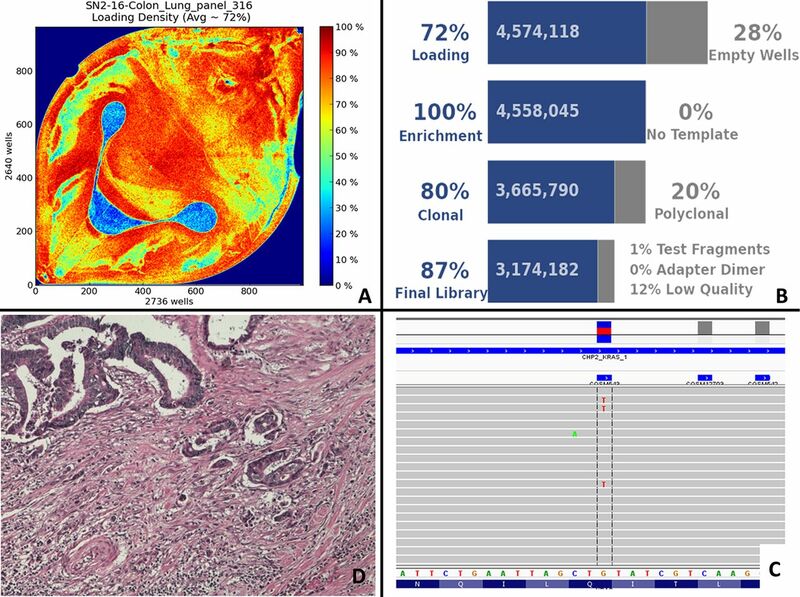 Conclusions Ion Torrent AmpliSeq Colon and Lung Cancer Panel sequencing is as robust as Sanger sequencing in routine diagnostics to select patients for anti-epidermal growth factor receptor (EGFR) therapy for metastatic colorectal cancer. Multiple genes of multiple mCRC patients can simultaneously be analysed by next-generation sequencing (NGS); thus, this technology may soon replace Sanger sequencing to select patients for anti-EGFR treatment.11 Among the most popular NGS benchtop platforms is the Ion Torrent Personal Genome Machine (PGM; Life Technologies, Carlsbad, California, USA) which requires only a small amount of gDNA (10 ng).12 Until recently, this NGS platform has employed very broad panels containing around 50 cancer driver gene targets.10 ,13–15 To encourage implementation of the NGS in predictive molecular diagnostics, Ion Torrent recently released a 22 gene target panel called the Ion AmpliSeq Colon and Lung Cancer Panel. The performance of this panel has previously been evaluated for clinical cancer testing by other groups retrospectively on archival16 and clinical trial specimens.17 The current study was conducted to verify the AmpliSeq Colon and Lung Cancer assay in the different setting of routine diagnostics. Prospectively, a large number of consecutive and unselected samples were simultaneously processed by Sanger sequencing and by the AmpliSeq Colon and Lung Cancer assay. Diagnostic accuracy, cost, time around testing (TAT) and the overall practicality of the two methodologies were evaluated. The aim was to assess whether the AmpliSeq Colon and Lung Cancer Panel on the Ion Torrent PGM could be an alternative to Sanger sequencing for genotyping KRAS, NRAS and BRAF genes in our laboratory. Like all laboratory-developed tests in molecular diagnostics, the analytical performance of NGS procedures must be internally confirmed before clinical implementation. Since the performance of the Ion AmpliSeq Colon and Lung Cancer Panel has previously been evaluated,16 verification (rather than formal validation) was carried out for three clinically actionable genes: KRAS, NRAS and BRAF. The HT29 (BRAF V600E), the SW480 (KRAS G12V) and the H1299 (NRAS Q61K) cell lines were obtained from CNR/IEOS (Naples, Italy). Each DNA cell line was serially diluted in wild-type DNA (derived from the SW48 cell line) to produce mixtures with 50%, 20% and 5% mutant alleles, the last percentage being the threshold usually adopted for clinical decision making.13 ,14 The ability of the Ion AmpliSeq Colon and Lung Cancer Panel to detect the most relevant mutational hotspots was also verified on a set of 15 mutation-positive (Sanger sequencing) formalin-fixed paraffin-embedded (FFPE) samples with known mutations in the BRAF (n=1; V600E), KRAS (n=9; G12R, G12S, G12C, G12D, G12V, G12A, G13D, Q61H, A146T) and NRAS (n=5; G12D, G13S, G13R, Q61K, Q61R) genes. Following approval from the institutional review board, the relative performance of the Ion Torrent assay and of Sanger sequencing on prospectively collected and processed routine diagnostic samples was assessed. Routine samples were simultaneously processed by our current technology, based on Sanger sequencing, and by Ion Torrent PGM sequencing. To this end, 114 unselected consecutive (including 99 surgical samples and 15 endoscopic biopsies) FFPE samples, referred from 18 different institutions, were prospectively processed by both methods. Only one single tumour sample from a given location (primary tumour n=105; metastases n=9) was tested for each patient. Our molecular laboratory is an accredited Italian Society of Pathology reference centre for RAS testing and the organiser in Italy for the ESP Colon External Quality Assessment Scheme. After obtaining the patient’s consent, oncologists and the primary pathologists from outside institutions record the clinical and pathological data (including the original pathology report) on a dedicated website. Then, the corresponding tissue sample is express-mailed to our central laboratory. Upon receipt of each sample, a representative H&E stained slide is reviewed by a pathologist and the area with the highest density of neoplastic cells is marked, annotating the percentage of neoplastic cells. Depending on the complexity of histology and on the density of the tumour, DNA was extracted using the QIAamp DNA Mini Kit (Qiagen, Crawley, West Sussex, UK) from two (resection specimens) or three (biopsy specimens) 10 μm-thick serial sections. An additional section (biopsy specimens only) was stained by H&E to confirm tumour cell percentage. Sanger sequencing was performed as previously described. Briefly, DNA targets for exons 2, 3 and 4 of KRAS and NRAS, and exon 15 of BRAF were amplified using laboratory-developed primer pairs, as previously reported.18 ,19 The concentration of reagents was optimised using 80 ng of DNA, 0.4 mM of each primer and 0.5 U of 5 PRIME Taq DNA Polymerase (Eppendorf, Milan, Italy) in a total volume of 25 μL. PCR conditions were as follows: initial denaturation for 5 min at 95°C, cyclic denaturation at 94°C for 30 s, annealing at 57°C for 30 s, elongation at 65°C for 30 s for 35 cycles, and final extension at 72°C for 2 min. Following PCR, the fragments were purified using the QIAQuick DNA purification kit (Qiagen) according to the manufacturer's instructions. Sequencing reactions were performed for both DNA strands by the Big Dye Terminator V.1.1 (Applied Biosystems, Monza, Italy) on a total of 10 ng of purified PCR products. Dye purification was carried out by alcohol/sodium acetate precipitation. Sequence analysis was performed on an Applied Biosystems 310 genetic analyser. The files obtained were aligned to the reference sequence and examined for mutations by the CodonCode software. DNA was extracted from cell lines and clinical tissue samples using the QIAamp DNA Mini Kit (Qiagen) according to the manufacturer's instructions. DNA was suspended in 30 μL of molecular biology water. DNA quantity and quality were assessed using the Qubit photometer (Life Technologies) and the Qubit dsDNA HS (High Sensitivity) Assay Kit according to the manufacturer's instructions. According to the manufacturer's protocols, 10 ng of DNA for each sample was used for library preparation with the Ion AmpliSeq Library 96LV Kit 2.0 (Life Technologies) and the Colon and Lung Cancer Panel (Life Technologies). This panel gives 90 amplicons covering 504 mutational hotspot regions in 22 genes (AKT1, ALK, BRAF, CTNNB1, DDR2, EGFR, ERBB2, ERBB4, FBXW7, FGFR1, FGFR2, FGFR3, KRAS, MAP2K1, MET, NOTCH1, NRAS, PIK3CA, PTEN, SMAD4, STK11, TP53), with performance of at least 500× sequence coverage for eight samples on one Ion 316 chip. For samples yielding less than 10 ng DNA input, additional cycling conditions were used for library preparation as recommended by the manufacturer. Each library was barcoded with the Ion Xpress Barcode Adapters 1–16 Kit (Life Technologies). Barcoded libraries were combined to a final concentration of 100 pM. Template preparation by emulsion PCR (emPCR) was performed on the Ion OneTouch 2 system (Life Technologies). Library quality control was performed using the Ion Sphere Quality Control Kit according to the manufacturer's instructions, ensuring that 10–30% of template positive Ion Sphere particles (ISP) were targeted in the emPCR reaction. Sequencing primer and polymerase were added to the final enriched ISPs prior to loading onto 316 (100 Mb output) chips. Sequencing was carried out on the PGM (Life Technologies). Data analysis was carried out with Torrent Suite Software V.3.2 (Life Technologies), considering only KRAS, NRAS and BRAF, while all other genes were masked. After alignment to the hg19 human reference genome, the Variant Caller plug-in was applied using the Colon and Lung hotspot file as a reference (downloaded from Ion Community, http://www.ioncommunity.lifetechnologies.com, last accessed 15 September 2014). The Ion Reporter suite (Life Technologies) was used to filter polymorphic variants. In addition, all nucleotide variations with less than a 5% variant frequency were masked. All detected variants were manually reviewed with the Integrative Genomics Viewer (IGV V.2.1, Broad Institute, Cambridge, Massachusetts, USA). In order to evaluate the overall practicality of performing Ion Torrent sequencing in our referral centre, TAT and consumable costs were taken into account. The TAT (the period from sample receipt to interpretation of the results) was recorded for every sample for both Sanger and Ion Torrent sequencing. The first step of our routine testing algorithm is evaluation of KRAS exon 2, where most resistance mutations are clustered. Only KRAS exon 2 wild-type cases undergo direct sequencing of PCR products of the remaining RAS and BRAF exons. For Sanger sequencing, consumable cost was evaluated for a single exon analysis and multiplied for the number of reactions needed for any given gene. For Ion Torrent sequencing, each patient analysis cost was estimated considering the fact that eight barcoded samples were loaded for each 316 chip. Serial dilution of the HT29, SW480 and H1299 cell lines to 20%, 10%, 5% of mutant alleles demonstrated that the Ion Torrent platform consistently detected mutations at the 5% level of mutant alleles. All of the 15 verification tissue specimens were correctly genotyped for KRAS, BRAF and NRAS by the Ion Torrent NGS. Most of the routine samples (109/114; 95.6%) processed on the PGM yielded an adequate library for subsequent sequencing, although library preparation failed in five cases. Three of the failed cases did not yield adequate results by Sanger sequencing either. In most of the adequate cases (85/109), amplification for library generation was carried out without major technical problems; in a minority of cases (24/109), the low level of library concentration (<100 pM) required DNA re-amplification. As reported in the Methods section, mutations detected by Ion Torrent with at least a 5% variant frequency were annotated (figure 1). Ten BRAF mutant cases (V600E, n=7; G596R, n=1; K601E, n=1; D594G, n=1) were detected by both Sanger and Ion Torrent sequencing. In addition, two BRAF mutations (G466E, n=1; G469A, n=1) not covered by our Sanger sequencing-based assay were only detected by Ion Torrent. A total of 38 KRAS mutations (exon 2, n=32; exon 3, n=2; exon 4, n=4) were detected by both techniques (figure 1). One KRAS Q22K mutation detected by Ion Torrent at a 5.5% mutant allele level was missed by Sanger sequencing (figure 1). Eight cases harbouring NRAS mutations (exon 2, n=2; exon 3, n=6) were detected by both sequencing methods. One G13R mutation with a 5.2% mutant allele frequency was only detected by Ion Torrent. Loading density (A) and performance parameters (B) of an Ion Torrent sequencing run, carried out using a 316 chip are shown. A low frequency of a KRAS Q22K mutant allele (C) was observed with an integrated genetics viewer in a case of colorectal cancer (D) with 30% neoplastic cells. The Ion Torrent mean TAT was 13.0 working days (range 7–14). The mean TAT for Sanger sequencing evaluation of KRAS exon 2, was 4.2 working days (range 3–6); in the cases also evaluated for the remaining KRAS, NRAS and BRAF exons, the entire process had a mean TAT of 10.4 working days. The cost of consumables for any single exon analysis by Sanger sequencing was €28. Consequently, the consumable cost of testing KRAS, NRAS and BRAF, including seven exons, was €196. For Ion Torrent sequencing, as eight barcoded samples were loaded for each 316 chip, the cost for each patient analysis was €187.23. This amount was slightly higher (€262.20) in a minority of cases (24/109) where the low level of library concentration required DNA re-amplification. Similarly, initialisation failures, occurring twice for a total of 16 samples, led to an increase of €7.80 per sample. In conclusion, Ampliseq-based procedures are feasible in a central laboratory setting and represent a powerful tool to refine even further personalised treatment regimens for patients with mCRC. A paradigm shift in colorectal cancer predictive testing is being driven by the recent requirement of the European Medicine Agency to analyse codons 12 and 13 in exon 2, codons 59 and 61 in exon 3, and codons 117 and 146 in exon 4 for both KRAS and NRAS. As multiple genes of multiple metastatic colorectal cancer (mCRC) patients can simultaneously be analysed by next-generation sequencing, this technology may soon replace Sanger sequencing to select patients for anti-epidermal growth factor receptor (EGFR) treatment. Ion Torrent AmpliSeq Colon and Lung Cancer Panel sequencing is as robust as Sanger sequencing in routine diagnostics to select patients for anti-EGFR therapy for mCRC.
. Association of KRAS p.G13D mutation with outcome in patients with chemotherapy-refractory metastatic colorectal cancer treated with cetuximab. JAMA 2010;304:1812–20.
. KRAS mutation testing for predicting response to anti-EGFR therapy for colorectal carcinoma: proposal for an European quality assurance program. Virchows Arch 2008;453:417–31.
. Sanger sequencing in routine KRAS testing: a review of 1720 cases from a pathologist's perspective. J Clin Pathol 2012;65:940–4.
. Next generation sequencing: a change of paradigm in molecular diagnostic validation. J Pathol 2014;234:5–10.
. Combining highly multiplexed PCR with semiconductor-based sequencing for rapid cancer genotyping. J Mol Diagn 2013;15:171–6.
. Targeted next-generation sequencing can replace Sanger sequencing in clinical diagnostics. Hum Mutat 2013;34:1035–42.
. Routine use of the Ion Torrent AmpliSeq Cancer Hotspot Panel for identification of clinically actionable somatic mutations. Clin Chem Lab Med 2013;52:707–14.
. Targeted, high-depth, next-generation sequencing of cancer genes in formalin-fixed, paraffin-embedded and fine-needle aspiration tumor specimens. J Mol Diagn 2013;15:234–47.
. The OncoNetwork Consortium: a European collaborative research study on the development of an Ion AmpliSeq gene panel targeting hot spots in colon and lung cancers. Cancer Research 2013;73(8, Suppl. 1):36.
. Clinical activity of FOLFIRI plus cetuximab according to extended gene mutation status by next generation sequencing: findings from the CAPRI-GOIM trial. Ann Oncol 2014;25:1756–61.
. Preparation of thyroid FNA material for routine cytology and BRAF testing: a validation study. Diagn Cytopathol 2010;38:172–6.
. KRAS mutation analysis on cytological specimens of metastatic colo-rectal cancer. Diagn Cytopathol 2010;38:869–73.
. Comparison of KRAS mutation analysis of colorectal cancer samples by standard testing and next-generation sequencing. J Clin Pathol 2014;67:764–7.
. Genomic and biological characterization of exon 4 KRAS mutations in human cancer. Cancer Res 2010;70:5901–11.
. KRAS mutation detection by high-resolution melting analysis significantly predicts clinical benefit of cetuximab in metastatic colorectal cancer. Br J Cancer 2012;107:626–31.
. Navigating the rapids: the development of regulated next-generation sequencing-based clinical trial assays and companion diagnostics. Front Oncol 2014;4:78. Contributors UM, GT: conceived and designed the experiments;UM, RS, DV: performed the experiments; UM, GT, EV, PP, CB: analysed the data; UM, EV, CB, PP, GT; contributed to the writing of the manuscript. Ethics approval The Institutional Review Board ‘Carlo Romano’ approved the study.